Enough! Enough of the imbalance that is destroying our democracies, our planet, and ourselves. We require a form of radical renewal unprecedented in the human experience. Enough of the pendulum politics of left and right as well as paralysis in the political center. Enough of the visible claw of lobbying in place of the invisible hand of competing. Enough of the economic globalization that undermines our sovereign states and local communities. Have we not had enough exploiting of the world’s resources, including ourselves as “human resources? Many people are concerned about these problems, far more than have taken to the streets. The will is there; an appreciation of what is happening, and how to deal with it, is not. We are inundated with conflicting explanations and contradictory solutions. This book presents a comprehensive framework, to suggest an dynamic way forward. The Triumph of Imbalance When the communist regimes of Eastern Europe began to collapse in 1989, pundits in the West had a ready explanation: capitalism had triumphed. They were wrong, and the consequences of that mistake are now proving fateful. It was balance that triumphed in 1989. While the communist regimes were utterly out of balance, with so much power concentrated in their public sectors, the successful countries of the West maintained sufficient balance across their public, private, and another sector. But a failure to understand this has been throwing many countries out of balance ever since, on the side of their private sectors. Welcome to the Plural Sector There are three key sectors in society, not two. The other one is known by a variety of inadequate labels, including “not-for- profit” and “civil society”. Calling it plural can help it take its place alongside the ones called public and private, while indicating that it is made up of a wide variety of human associations. Consider all those activities that are owned neither by the state nor by private investors: foundations, churches, unions, cooperatives, Greenpeace, the Red Cross, and many renowned universities and hospitals. Also included here are the social movements that arise to protest certain practices and the social initiatives created by community groups to develop better practices (for example in micro-financing and renewable energy). Despite the prominence of all this activity, the plural sector remains surprisingly obscure, having been ignored for so long in the great debates over left versus right. This sector does not function between the other two, as if on some straight line. It is a different place, as different as the other two sectors are from each other. Accordingly, picture a balanced society as sitting on three solid legs: a public sector of respected governments, for purposes of protection (such as policing and regulating); a private sector of responsible businesses, for purposes of consumption; and a plural sector of robust communities, for purposes of social affiliations. 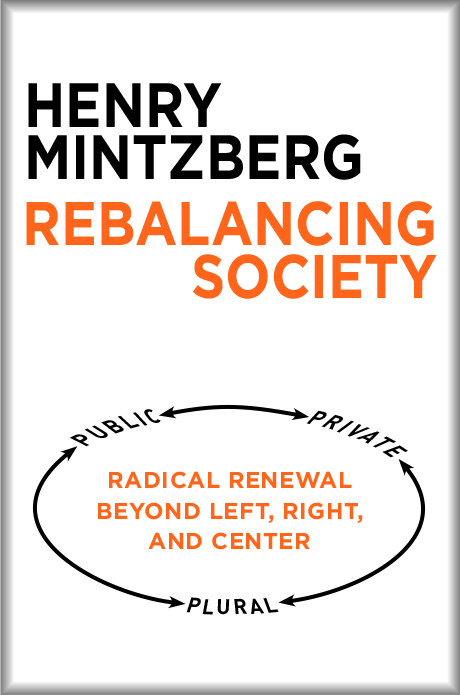 Regaining Balance How do we regain balance in our societies? Some people believe that the answer will have to lie in the private sector, namely with corporate social responsibility. This is certainly to be welcomed, but anyone who believes that it will compensate for the corporate social irresponsibility we see around us is living in a win-win wonderland. Other people expect democratic governments to act vigorously. That they must do, but will not so long as they continue to be overwhelmed by private sector entitlements, global as well as domestic. This leaves but one sector, the plural, which is not some “them”, but you, and me, and we, acting together. We need to engage in social movements and social initiatives that challenge destructive practices and replace them with constructive ones. We need not be passive human resources, in the service of imbalance, but can be resourceful human beings, in the service of our progeny and our planet. In 1776 Tom Paine wrote to the American people in his pamphlet Common Sense that “We have it in our power to begin the world over again.” Paine was right in 1776. Can we be right again now? Can we afford not to be?